Now presenting to you what Chef Jay has been cooking up, so to speak. Presenting the KISS OF FIRE roll, image found below. A shrimp tempura roll, wrapped up and topped with avocado and unagi. 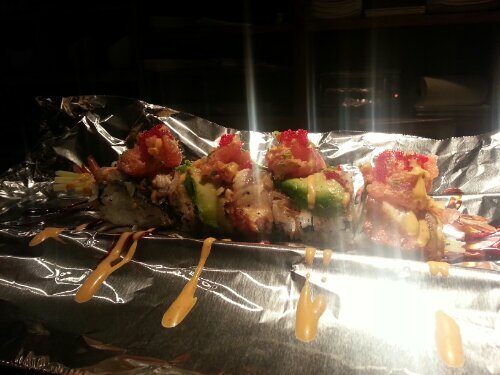 Dollops of spicy tuna and tobiko, and drizzled in sauces. The entire roll is wrapped up in foil and lit at the table, presenting a smoky, crispy, “sushi-bbq.” Greet the cool weather with some heat at Bluefin2!